Photo by Roman Kelller, courtesy of ETH Zurich. Consider the relationship between imagination and reality: the ideas that seem so brilliant as you emerge from a dream, only to become impossible to put into the language of the waking world. The gravity of the world, sinks balloons and limits the castles we can build from ideas alone. An architect’s job is to dream within the world of gravity. An artist can build an impossible house and we might call it beautiful, whimsical, or tragic when it falls down, but nobody would be expected to live in it. When an architect dreams, lives are at stake. There is nothing romantic about a housing code violation. Artificial Intelligence can help. The DFAB House in Switzerland is the product of this collaboration between the mind of an architect and the computational power of algorithm. The result is something like an assistant that can figure out the words to explain those impossible-to-describe images of fleeting dreams. Imagine an algorithm that simulates folding paper thousands of times, until it acquires the texture and firmness of concrete. Imagine a machine that could pinpoint (literally) the precise placement of load-bearing weights, using the exact amount of materials necessary, and order a robot to move them into the place they need to be, within millimeters. Humans reap the rewards of this process: more efficient buildings, less waste, aesthetics that would otherwise be impossible to achieve. This is the future of digital fabrication, and it’s not just running in the simulated reality of our laptops. The building has been brought to life, and life has been brought to the building: people live there, in this house designed by humans and machines. Matthias Kohler at swissnex San Francisco. Photo Astra Brinkmann. Kohler founded the award-winning architecture practice Gramazio Kohler Architects together with his partner Fabio Gramazio. 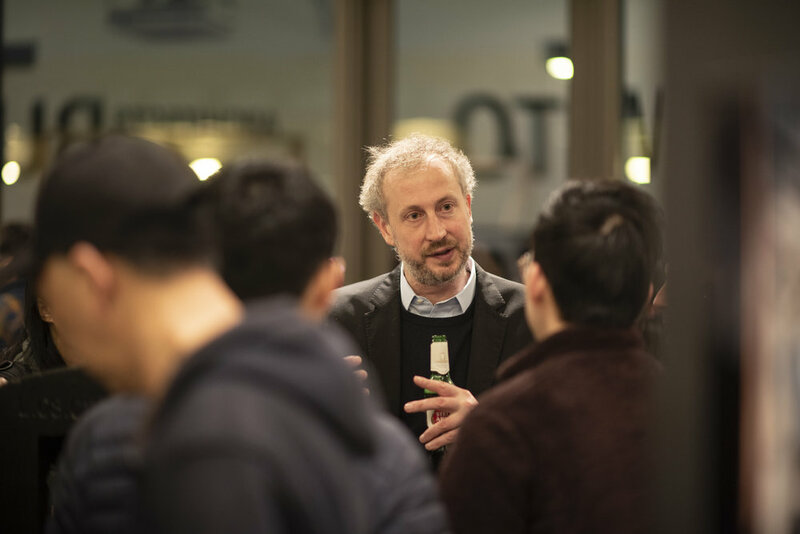 As a full professor at ETH Zurich, Kohler is the founding director of NCCR Digital Fabrication, the first National Centre of Competence in Research in the field of architecture funded by the Swiss National Science Foundation. That’s where he created the DFAB House project. Kohler started fusing computers and architecture together in the 1990s — when the field was successful only in modeling complex forms that nobody could actually build. By 2005, ETH Zurich had completed its creation of a unique architectural research laboratory with an industrial robot on site. The robots of science fiction are depicted as tin cans on wheels or metallic humans with chrome legs, walking through the world with a clumsy but good-enough stride. In the real world, the vast majority of robots are dismembered arms. Through the 1960s, some of the first industrial robots were dedicated to welding. More recently, sales of robots have doubled every year for 15 years. They are in factories, welding cars; they are in our homes, cleaning our carpets; they’re in our police departments, defusing bombs; and today they make up the entire population of Mars. These are all machines, but our definition of a robot is transforming in the age of artificial intelligence. Now we assume a robot is an AI. We want them to be autonomous, capable of navigating the world independently, but we also use the term to describe algorithms that power decision-making in machines. In essence, robots are always dismembered — a brain inside a map, an arm inside a factory. That is manifested in the DFAB House, a collaboration of the Swiss National Centre of Competence in Research (NCCR) in Digital Fabrication which was built on top of the NEST building of Empa and Eawag in Dübendorf, Switzerland. 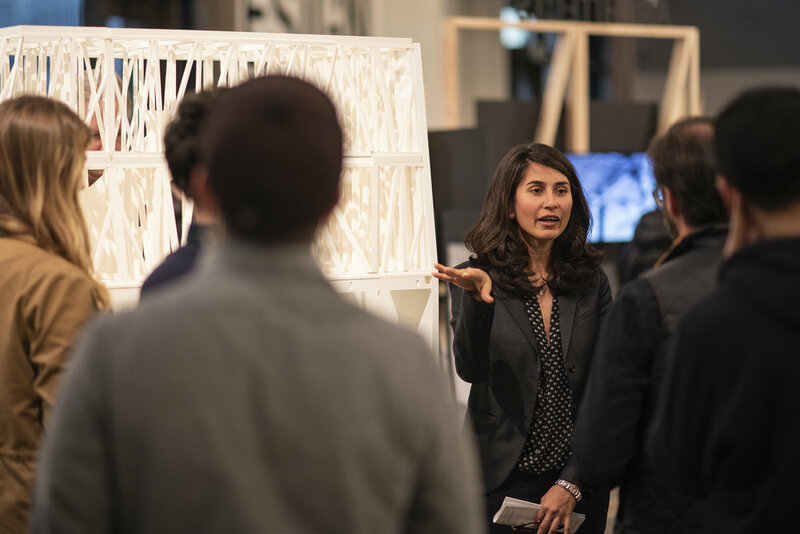 The project is a collaboration of researchers from eight chairs at ETH Zurich, industry experts, and planning professionals that was conceived as a way to explore and test how digital fabrication can change the way we design and build. Mania Aghaei Meibodi at swissnex San Francisco. Photo Astra Brinkmann. “It doesn’t happen so often that you can do research and practice at the same time,” said Mania Aghaei Meibodi, an architect specialized in computational design and digital fabrication. Rethinking architecture means looking at the algorithmic possibilities of a robot mind. Able to calculate complex mathematical equations on the fly means that multiple architects can design the same building, with changes transported across the entire structure. When planning is digital, redrafting a plan over a few days or weeks can become a simple algorithmic tweak, recomputing the needs of the structure to fit the new plan. Benjamin Dillenburger at swissnex San Francisco. Photo Astra Brinkmann. Today he’s renowned for his pioneering architectural work — including two full-scale 3D printed rooms for the FRAC Centre and the permanent collection of Centre Pompidou — which use computers to unlock new strategies for design and aesthetics. Dillenburger’s ceilings within the DFAB House are extremely efficient, calculated to use the least required materials without losing strength, creating lighter structures with less waste. They take on new qualities — something precise, but biological, like an oyster shell. Then robots will help to build it. Enter the arm. Photos by Roman Kelller, courtesy of ETH Zurich. This is where the robotic arms are so important. Machines are able to design in a way that reflects the precise math of a computer. It’s not just hammers and nails — a task humans are still involved in, even in the DFAB House — but about placing a piece of lumber in the exact location it’s needed to achieve the computer-assisted design. This wouldn’t have been possible 15 years ago. It’s the rapid development of new sensing technologies, machine learning tools, even the location-sensing tech so often discussed as the future of self-driving cars. Advances in data allow a robot to better handle the (typically vast) gap between plans on a laptop and the real-world construction site. These advancements are fueling the innovations of the DFAB House. Consider the “In Situ Fabricator,” named for what it is: a robot that can fabricate structures on-site. Described as “a context-aware mobile construction robot,” to the layman, it’s a robot arm on tank treads. In action, it’s a machine smart enough to respond to what it’s building, and to adjust decisions based on whatever it sees. To an observer, watching this robot build a massive, curved wall on the ground floor of the DFAB House is something from a meditation class. The in-situ fabricator robot assembles a shape in slow-motion, laying out steel cable and making hypnotic clip marks precisely where they’re needed. Over time, the mesh creates a curving S-shape, which humans fill in with concrete. The structure this robot built is able to hold the concrete in place with the minimal amount of steel and formwork. 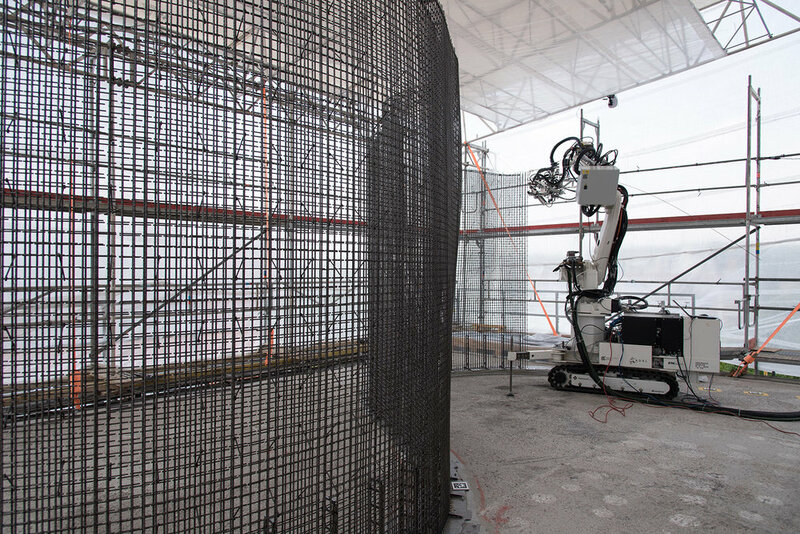 Another robot was used for “smart dynamic casting,” building mullions, the vertical beams on the ground floor of the DFAB House. By repositioning a fragment of a mould that can adjust its shape in real-time, the smart dynamic casting robot is able to create the sleek shapes with smooth surfaces that create an undulating pattern on the ground floor. That pattern is not just aesthetic: it’s the result of a computer determining precisely where the beam needs to be thick and where it can be thin, limiting the use of materials to exactly what’s needed. The result of construction robots — and these are only two examples of many — is so far a dramatic reduction in waste and materials, which is by design. Sustainability is a key ethical principle of digital architecture. The industry assumption is that 2.5-5% of construction materials are wasted; academic researchers peg this at closer to 15% with wide variations. Concrete sits in landfills, slowly turning back to sand, over the course of thousands of years. In the meantime, it takes up space in places like Shenzen, China, where rapid building has created waste at a pace of 2 billion tons per year, 84% of which goes straight to landfill. To get a sense of this we can focus on one material alone: concrete. The only substance humans consume at a higher rate than concrete is water. For every person alive today, there are three tons of concrete produced every year: that’s the amount used in tearing down buildings, creating new ones, paving and repaving roads, parking lots, and tunnels. Creating concrete is energy intensive, making the industry one of the top-three producers of CO2 on Earth. Digital fabrication offers a more efficient use of materials across a variety of structures and designs. One very literal realization of this at the ETH Lab is “Rubble Fabrications,” in which a robot is taught to look at building sites and create small, carefully assembled structures from the leftover rubble. In the future, it’s possible that the stacks of debris that go into landfill today could be re-used more intelligently by machines. Imagine computers with a library of rubble patterns which they could assemble into puzzle-block structures. But the sustainability impact is most dramatic in the use of computation and fabrication technologies that reduce the need for material consumption in the first place. 3D printing with sand, for example, uses less energy than mixing and pouring a barrel of concrete. But you can also print the structure instead of creating a mould that gets tossed into the landfill. “They simply aren’t needed with 3D printing in architecture,” said Dillenburger. The DFAB House smart slab is one example. 3D printing a concrete roof reduced the use of materials by 60%, because it simply didn’t print unless it had to. As a result, the seashell-like ceiling of the DFAB House is less than an inch thick in some spots where thicker reinforcement wouldn’t make any difference. That can make a ceiling 30% lighter, which goes on to reduce the materials used in building supports. 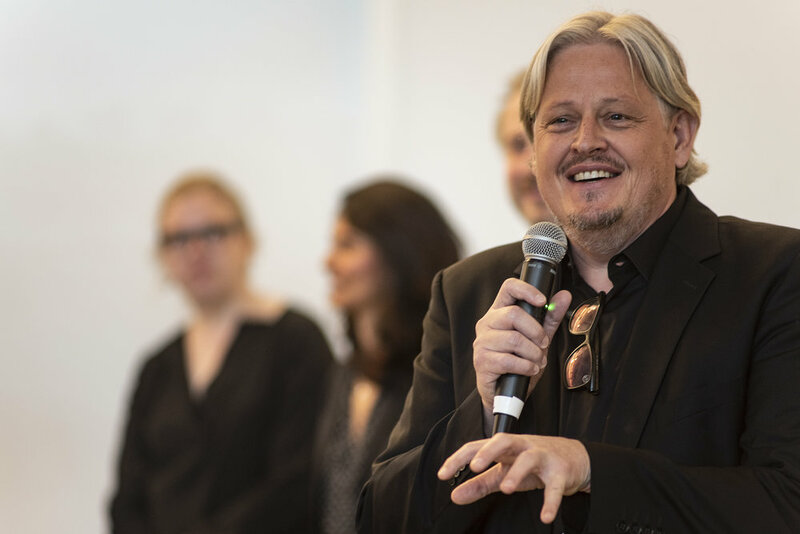 “As an architect you’re not just analyzing the existing world but thinking about future worlds,” Dillenburger said. The DFAB House is a meaningful step toward a future of digitally fabricated buildings, translating designs from the minds of researchers into the day to day world, and inspiring new visions of what’s possible. Already, that includes assembling building by drones, and robots armed with lasers to shape patterns at the scale of a grain of sand. The future of digital fabrication is tied to the future of computation, printing, and robotics. Interestingly, it isn’t the state of robotics or materials that serves as the current constraint: it’s the computational tools we use to design them, to tell those machines what to do. Once called "the Harry Potter of the Digital Vanguard," Eryk Salvaggio is a writer, artist, and futures researcher at swissnex San Francisco. Special thanks to Jacob Beemer & Doriane Mouret of LAtelier Marketing for producing these interviews & the “How to Build a House” exhibition video.